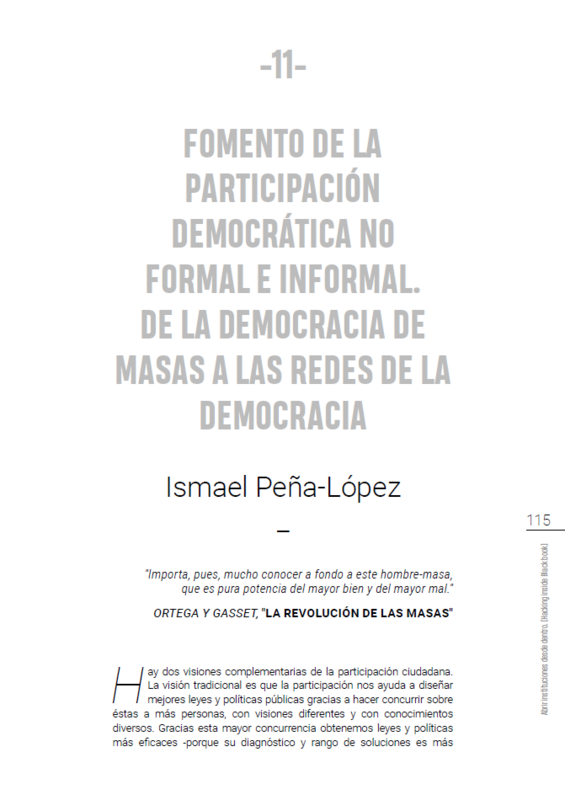 The book is published in English and Spanish — Convirtiendo participaciÃ³n en soberanÃ­a: el caso de decidim.barcelona — both of them downloadable in full text below. However, this new era of citizen empowerment continues to require â€“probably more than everâ€“ democratic institutions that are especially responsive to the changes that are taking place on the streets. 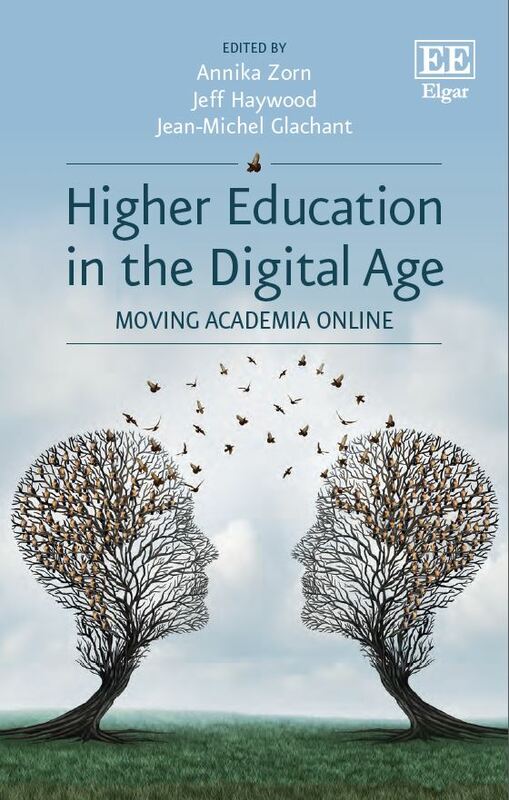 Institutions that adapt, that innovate and that, ultimately, transform themselves to keep on being a chain of transmission between the will of citizens and collective decision-making. The Spanish local elections in 2015 brought to many Spanish cities what has been labelled as â€œcity councils of changeâ€: city councils whose mayors and governing representatives come from parties emerging from the 15M Spanish Indignados Movement. Many of them, led by Madrid and Barcelona, tried to bring into office the same technopolitical practices that proved so useful to articulate a broadly supported movement when out in the streets. This book focuses on the socio-political environment where this phenomenon takes place, specifically in Madrid and Barcelona, the two major cities of the state and featuring these so-called city councils of change, and how it was deployed in Barcelona in the first months of 2016 during the definition of the strategic plan of the city. Using Anthony Giddens Structuration Theory, we will be able to assess if not the final outcomes and impact of this technopolitical turn in decision-making â€“ surely too soon for such an assessment to be performed â€“, at least the main shifts in meaning, norms and power which, as tipping points, can shed a light on the main social trends that these political movements might be unleashing. In Part I we draw a Policy Brief â€“ Increasing the quality of democracy through sovereignty devolution â€“ were we present the main drivers of change, the essentials of the several shifts brought by the new ethos, and the keys and aspects to be considered to understand the qualitative changes in our opinion already in play in the current political scenario. Part II â€“ ICT-mediated citizen participation in Spain: a state of the art â€“ revisits e-participation since the beginnings of the XXIst century onwards and most especially in the aftermath of the 15M Spanish Indignados Movement, proposing that recent ICT-based participation initiatives in such municipalities could be far from just polling the citizens and be, instead, the spearhead of a technopolitics-aimed network of cities. We critically explore the role of ICTs in reconstructing politics in Spain and which led to Spainâ€™s new experiments in participatory democracy such as Decide Madrid, launched in the city of Madrid to enable strategic participatory planning for the municipality, and decidim.barcelona another participatory process launched in Barcelona initially based in the former. Part III â€“ The case of decidim.barcelona: Using a Structuration Framework Towards a Theory of ICT-mediated Citizen Engagement â€“ analyses the participatory making of the Barcelona Strategic Plan (PAM) 2016-2019 for the whole term in office. The first section revisits the general context of the city in terms of ICT-mediated politics and explains the design and general functioning of the new strategic plan and its participatory process. The second section explains the methodology used for the analysis, which is carried on in the third section. PeÃ±a-LÃ³pez, I. (2019). 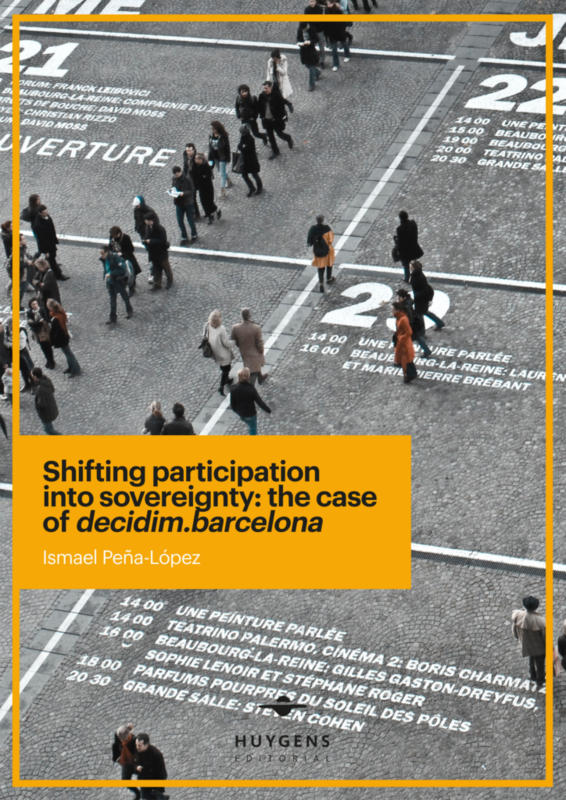 Shifting participation into sovereignty: the case of decidim.barcelona. Barcelona: Huygens Editorial. PeÃ±a-LÃ³pez, I. (2019). Convirtiendo participaciÃ³n en soberanÃ­a: el caso de decidim.barcelona. Barcelona: Huygens Editorial. In June 2016 four friends gathered around a table. Ricard was working on his PhD thesis, which I supervised, and summoned the help of a data expert, Toni, and someone knowledgeable on analysing networks of people, Oriol — later on NÃºria Vega would join the team to improve the whole project and, specifically, bring brains and muscle to the field work. While we waited for the paper to be published, Oriol left us forever. As we stated in the paper, Oriol, it was fun working with you while you were among us. Now you are gone, but the good work remains. So long, friend. Ricard, Ismael, NÃºria and Toni. 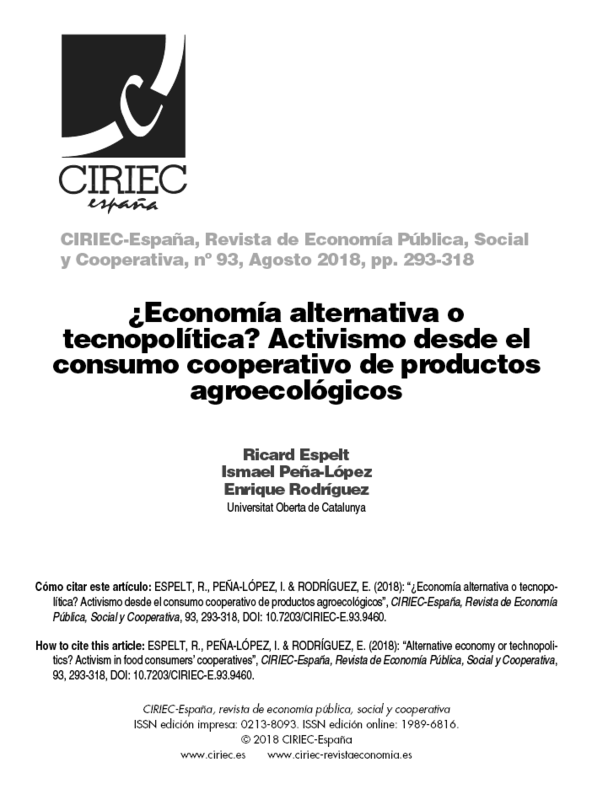 Espelt Rodrigo, R., PeÃ±a-LÃ³pez, I., Miralbell Izard, O., MartÃ­n, T. & Vega RodrÃ­guez, N. (2019). 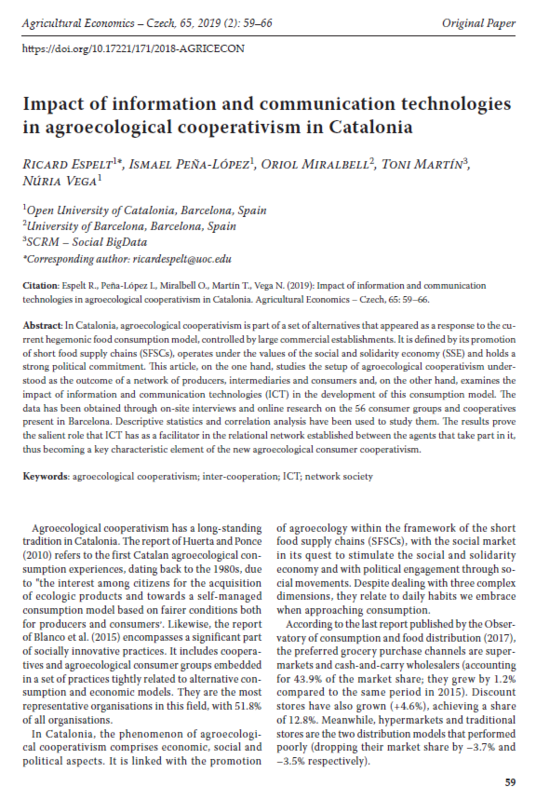 “Impact of information and communication technologies in agroecological cooperativism in Catalonia”. In Agricultural Economics, 65 (2), 59-66. Praga: Czech Academy of Agricultural Sciences.